On April 1, the New England Stormwater Collaborative presented its inaugural STORMY Awards, which recognize communities and utilities for their best stormwater ideas that increase efficiency, funding, or political support. The collaborative recognized five organizations, including the Town of Lexington, Mass., which increased the efficiency of its municipal illicit discharge detection and elimination program through volunteer monitoring. The City of Bristol, Conn., was awarded for a proactive strategy to provide and fund long-term maintenance of stormwater controls. Finally, three regional coalitions — the Northern Middlesex Stormwater Collaborative in Massachusetts, the Chittenden County Regional Planning Commission in Vermont, and the Central Massachusetts Regional Stormwater Coalition — received awards. By establishing common programs, these coalitions address water quality issues beyond community boundaries and share resources, enabling them to reduce duplicate efforts, increase training tools, and spread consistent public outreach messages. In selecting the winners, judges looked at the simplicity and resourcefulness of programs as well as their relevance and transferability to other communities. In 2013, members of the New England Water Works Association, New England Water Environment Association (NEWEA), and the New England chapter of the American Public Works Association formed the New England Stormwater Collaborative. A year later, the collaborative surveyed municipal managers, consultants, and staff to understand their stormwater management needs and issues. Of the 408 respondents from across New England, 56% noted that stormwater runoff and drainage management was of “very high concern.” The single most important issue to respondents was source water protection (20%), followed by Municipal Separate Storm Sewer System (MS4) permit requirements (17%). In light of the lack of political support, scant attention, and little dedicated funding for stormwater issues, members of the collaborative sought to increase awareness of successful stormwater ideas. Through the STORMY Awards, the collaborative is drawing attention to case studies that highlight effective and affordable steps communities can take to address stormwater management challenges. advocating for action on sound stormwater management practices. The Town of Lexington, Mass., Department of Public Works — Engineering Division won a STORMY Award for increasing efficiency by utilizing university student volunteers to improve illicit discharge detection and elimination (IDDE). 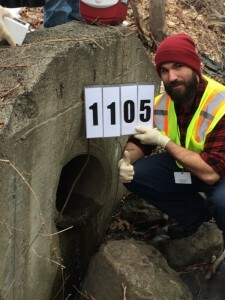 In the fall of 2011, Lexington’s engineering and conservation divisions piloted a volunteer water quality program to assist the town with identifying illicit discharges and improving the area’s stream health. Building on the success of the volunteer program, the Engineering Division developed a municipal partnership with the University of Massachusetts (UMass) Lowell. Lexington engineering staff worked directly with UMass professor Edward Hajduk, who helped connect the town with student volunteers and ensured that program content met the student interns’ curriculum needs. Town staff met with the student interns to discuss what their objective would be, why it was important, and how to accomplish their tasks safely. This program added 244 person-hours to the Town of Lexington’s IDDE program with little cost to the town. The students gained valuable field experience as well as mentoring from engineering professionals. The program’s success was founded on solid training and written health and safety protocols. It has led to an ongoing internship program with the university. The program provides valuable IDDE and permit compliance data to the town. The program also provides a research opportunity to compare the results of ammonia test strips and ammonia lab testing. The City of Bristol, Conn., received a STORMY Award for its proactive strategy to ensure and fund long-term maintenance of stormwater controls. With significant development increases in the 1980s, Bristol needed to increase maintenance of its stormwater control structures. The city created a fiscal entity called the Storm Water Control Trust, which requires organizations that propose stormwater control structures to specify a long-term ownership and maintenance plan. The proposers have three options: They can turn the structure over to the city with a monetary deposit for long-term maintenance, create a homeowner’s association that would coordinate maintenance, or relinquish ownership and maintenance responsibility to another entity. After construction and once the municipal trust takes ownership of a stormwater control, the developer is no longer liable for that system, and the city monitors it. The trust keeps a detailed inventory of properties and inspects the systems three times a year. The trust is the fiscal entity that receives funds and controls expenditures for maintaining or repairing the systems. The trust also oversees an investment portfolio to grow its endowment. 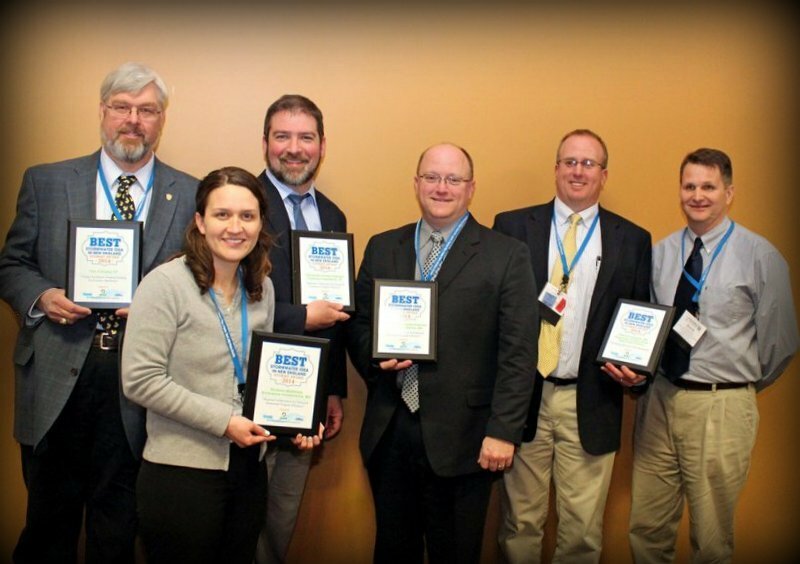 Three entities received STORMY Awards for their regional collaborative efforts to improve stormwater program efficiency. They are the Northern Middlesex Stormwater Collaborative, the Chittenden County Regional Planning Commission, and the Central Massachusetts Regional Stormwater Coalition. In New England, a town is the basic unit of local government and has a well-established home rule form of governance, which provides municipalities with maximum authority to govern themselves. Municipalities often are small — between 5 and 52 km2 (2 and 20 mi2) — but still primarily are the regulated entity under the MS4 general permit program. In New England, the MS4 permit program regulates more than 440 individual municipalities. This creates obvious redundancies and unique challenges for effective regional initiatives. The Northern Middlesex Council of Governments established the Northern Middlesex Stormwater Collaborative (NMSC) in 2013. Now comprised of 13 communities, NMSC’s regional approach to meeting MS4 requirements is a more effective, watershed-based model. Additionally, this approach enables NMSC to enhance the quality of service provided to residents while minimizing costs through resource sharing among local governments. Through the establishment of common programs, each community has reduced its responsibility for creating, implementing, maintaining, and managing separate but similar programs. In the past 2 years, NMSC implemented a common public outreach and education program; regionalized stormwater-mapping activities; is coordinating regional procurement for contracted stormwater services; and developed workshops and training sessions for municipal staff, boards, and officials. Funds from two Community Innovative Challenge grants established NMSC. The Massachusetts Executive Office for Administration and Finance administers the grants. In northwest Vermont — with the support of the Chittenden County Regional Planning Commission — 12 MS4s have worked since 2003 to pool resources to engage the public in a one-message, one-outreach effort. The MS4s first benchmarked current public understanding using a survey to create measurable public outreach improvement goals. They then hired a social marketing firm to implement a combination of television, radio, and online advertisements to encourage residents to visit the program’s website. Online, visitors can engage with messages linked to specific stormwater problems, such as pet waste, car washing, and excessive runoff. More recently, the MS4s also have contracted with a regional natural resources conservation district to engage the public in hands-on projects, including rain barrel workshops and rain garden planting. Also using funding from the state’s competitive Community Innovation Challenge grant program, the coalition has created many products and purchased tools that enable its members to meet MS4 requirements. The New England Stormwater Collaborative’s 2014 survey indicated that additional work is needed to adequately increase political support and funding for stormwater management programs. Among respondents, 63% said that funding is their primary obstacle — 44% had no specific budget to address stormwater management, and 37% had annual budgets of less than $100,000. These responses indicate that New England may be far behind its Mid-Atlantic peers where funding studies show average non-capital stormwater spending is $35 per capita. Additionally, 61% of respondents had not considered implementation of a dedicated fund and entity for delivery of stormwater management services. The survey ranked general awareness of stormwater issues second as a barrier to executing an effective stormwater management program. The collaborative aims to become a platform for the dissemination of great, simple ideas that improve a community’s stormwater management level of service with the ultimate goal of increasing municipal leadership’s understanding of the need for sound stormwater management and a willingness to invest in successful practices. 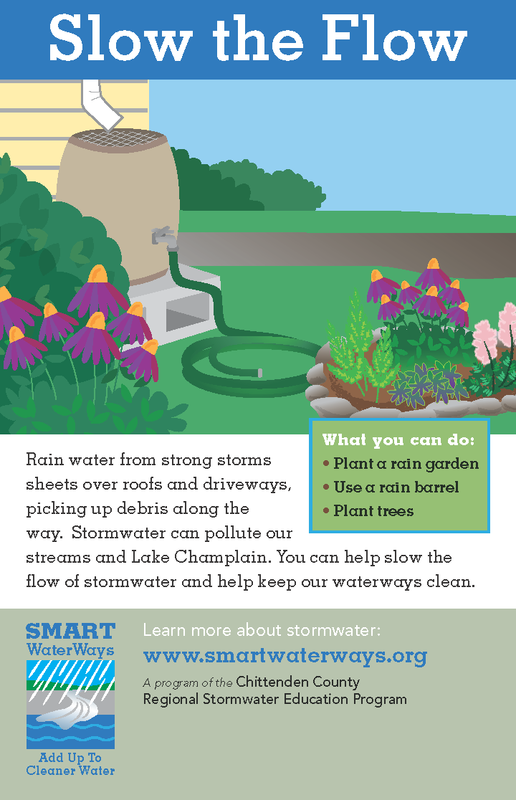 The STORMY Awards are one way to increase stormwater awareness by the public and elected officials. Despite limited political support and little funding, STORMY Award winners created resourceful solutions that increased their efficiency and effectiveness at meeting permit requirements. These communities show that investing in stormwater services can produce smart and sustainable programs that increase public engagement and improve water quality. With additional resources, these and other stormwater programs could create even bigger positive impacts.